We had our first "proper" volunteering session on Tuesday. We held a little one a fortnight ago but that was just a trial. This time we had seven people squeezed into Mark's wee office. I felt a bit disorganised as I was trying to talk everyone through their specific tasks and running about here and there. We actually got a good bit done. 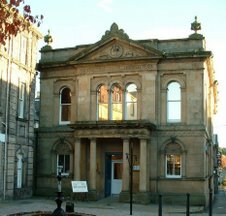 Two people started working on newspaper articles about for the local newspaper - The Forres Gazette - one started research on Alexander Falconer; one started indexing oral history; two people started an oral history recording in the court room and one person tried out an i-pod nano as we hope to let visitors use these when the museum is re-opened. Then we all sat down, had tea and brainstormed our proposed Christmas Exhibition to be called "Christmas Spice". Primarily it will be about Christmas Spices but will also take in the spice trade and explorers. And what of Mark, our hyperactive Project Development Officer, I hear you ask. Well, he's gone off on holiday for a fortnight to America meeting up with old friends. I think his absence added to my nervousness as it was the first time I 'd led a session on my own. He left us strict instructions not to go mess up his desk but I'm afraid the tea tray and some ladies handbags were put down on it - sorry Mark. He's graciously given us one tiny little shelf to use for our bits and pieces. Firecracker (Mark's little glove puppet friend) was on hand to watch over us so we felt we had to behave ourselves!